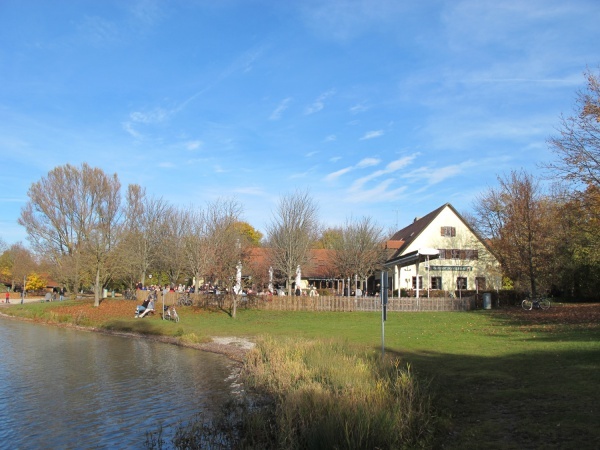 The Gasthof Feringasee beer garden is located at the lake Feringasee in Unterföhring, 12km from the city centre of Munich. The restaurant and beer garden exists since 1982 and is popular amongst swimmers and a mixed crowd of city dwellers seeking recreation by the lakeside. The beer garden has about 1,500 seats, divided between a serviced and self-serviced area. While the serviced area is next to the building, the self-serviced beer garden benches stand in the shade of chestnut trees. Regardless of where one sits there is always a view over the lake. The self-serviced food stall offers cold and warm meals, such as spare ribs, Rollbraten (rolled roast), Hendl (roasted chicken), Schweinebauch (pork belly), Bauernente mit Kartoffelknödel (farmers duck with potato dumpling), Leberkäse (meat loaf), Wurstsalat, Käseplatte and Obatzda (Bavarian cheese specialties) as well as Steckerlfisch (grilled fish on a stick). The beer served is Spaten and one Maß Hell (lager) costs €6.60 (May 2013). Unlike many other beer gardens, the self-serviced area is open throughout the entire year and sells Glühwein during the cold months. Feringasee is an artificial lake which began as a flooded gravel pit used for collecting gravel in building the nearby highway in the late seventies. As more people discovered the lake, Gasthof Feringasee was built directly at the shoreline. Depending on the direction of the wind, the noise from the traffic may be heard. The beer garden is a pleasant two and a half kilometres walk from Unterföhring train station, firstly through the media city and thereafter across mostly fields.